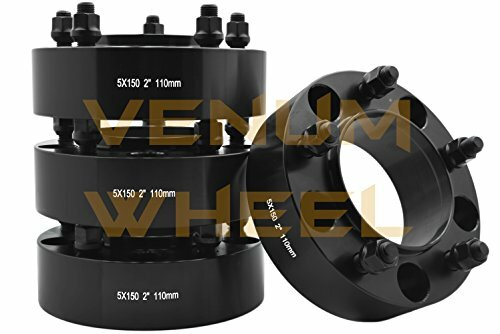 4 Brand New 2" Thick Toyota Black Hub Centric Wheel Adapters Fits The Following Vehicles with 5x150 mm bolt pattern. Applications: 2007-2016 Tundra, 2008-2016 Sequioa 1998-2016 Land Cruiser, 1998-2007 Lexus LX470, 2008-2016 Lexus LX570 - Installation should only be performed by a trained professional. - Make sure you get 6-8 FULL TURNS of the lug nuts when tightening. - Failure to follow proper procedures may cause your lug nuts to come undone while driving!!! These adapters are not like any others in the market. We tested these adapters under rough off road terrain and have hold up very well. The best and last adapters you will ever need. We also carry them in 1", 1.25", 2", 2.5", 3", 3.5", 4" Thick. Made In The USA Other sizes available 1", 1.25", 2", 2.5", 3", 3.5", 4" Thick.